If you’ve got young kids, then hang on to your (Easter) hats – from the annual Easter hat parade, to egg painting, and creating fun and fancy Easter baskets, there’s no getting away from Easter craft at this time of year. We are giving away 11 Pop’lol prize packs, containing a 16-piece Pop’lol set valued at $45 each. With Pilot’s Pop’lol range, getting crafty with the kids has never been easier. Featuring thirty vivid and vibrant gel ink colours, including metallic, pastel and bold colours, the gel ink is so rich in tint that you can even use Pop’lol on dark backgrounds and it will still stand out. Pilot Pop’lol gel pens come in 0.7mm tip size that gives plenty of control for even the smallest of hands, making it easy to draw outlines and designs in detail. Mr John Johnston, marketing manager, Pilot Pen Australia, said that crafting and colouring at home was on the rise, with many adults of all ages, with or without kids, taking up the hobby for themselves. “Home craft is increasing in popularity and we have seen an increase in demand for many of our colouring pens such as Pop’lol and our recently launched Pintor Paint Markers as a result. We have seen some fantastic artistic creations too – many of which are shared with us on Instagram and Facebook!” he said. If you’re looking for creative inspiration, head to www.pilotpen.com.au for some easy Easter craft ideas and downloadable templates. Pop’lol is available from Officeworks and selected stationery stores, RRP at $2.80 ea. Please note this competition is open from 23 March 2019 until 30 April 2019 and is only available to members of Mouths Of Mums. This competition is a game of skill – answer in 50 words or less. We are unable to accept entries posted via facebook. Facebook LIKE functionality is not a requirement of entry to this competition. The winners of this competition will be published on this page. Winners’ name and address will be provided to the promoter of this competition and prizes will be sent to the address you have in Your Profile. Please ensure your details are up to date so that you receive your prize. We love to sew. We make pencil cases to give to friends. So much fun! She likes to draw, paint and decorate. With the recycled papers that she drew on she then we use it to make paper origami together. All my kids love being creative. We use recycling and think outside the box. Anything on a tight budget that makes the kids smile. MY daughter had very good skills in paintings .so love to do anything that makes her happy and feel connected with her . its like i am again living my childhood . We do colouring in play doh .. Gardening we grow vegetables might not be a graft but hey a lot of fun making mud pies . We do cooking and decorate cakes and biscuits . We love creating paper mache. It’s messy but so fun! Play dough. I make it, then spend hours with grand kids making sculptures of their favourite toys, animals and imaginary friends. 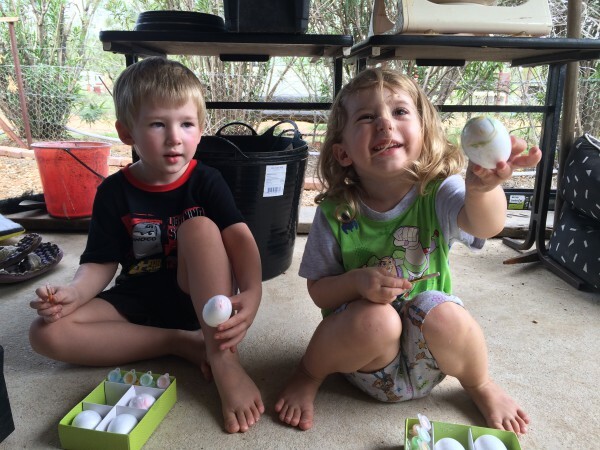 Painting Easter eggs! It’s messy but both kids enjoy creating different colours Bd patterns with paint. I love colouring in with my kids still! Then tell us in 50 words or less what's your favourite craft activity to do with your children?